Some of you may remember the virtual quilting bee I joined a few months back. It's called Sew Bee Wonky and the button on the sidebar will take you there if you want to look around. Well it's my turn this month! All through September I will be getting quilt blocks in the mail made to my specifications, with my fabric but with everyone's own personal twist! I'm asking for 12x12 blocks in the wonky log cabin style. The one above is a test block that I made. 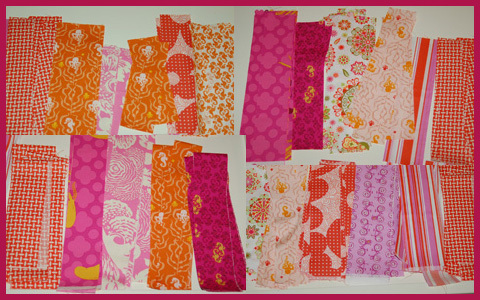 I'm seriously crushing on orange anything right now so I chose some orange and pink fabrics to send out. I love, love, love the Heather Ross Mendocino line. Octopi and seahorses! Too bad there weren't any starfish. Besides going all over the U.S, one package went to Australia and one went to Ontario. My quilt will be international! The blocks will be scrappy and wild so I think I'll sash them in a Kona neutral solid. Maybe "stone" or "coal"? Not sure yet. 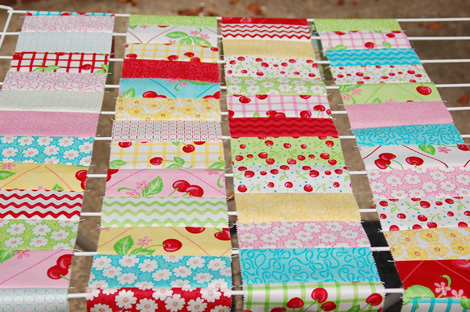 It's going to be a stacked coin quilt with cherries. Fun! My Dipped Infinity Scarf is almost finished so that will be blogged this week. I had to abandon ship on the pattern a bit. More on that later when I have pictures to show! that sew bee wonky sounds like such a cool project. hope it turns out great! wow, wow, wow! i adore your wonky square - especially the fabric with green medallions! 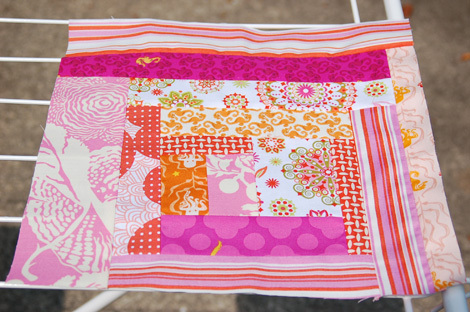 your niece's aqua + red quilt is gonna be stunning! plus she's got the best name in the world! I adore the pinks and ornages together! Major crush on this color combo and it brought back a flood of memories of being a little girl and having these two colors as my abolute favorites! Magical! And then you stun with another wonderful quilt in progress. You are so gifted! This baby quilt is going to be so cute! Baby Sophie is going to have a very happy quilt! This page contains a single entry from the blog posted on August 29, 2010 3:40 PM. The previous post in this blog was I am a triathlete. . The next post in this blog is Still Alive!.